I am trying to create a basic OS X Framework, right now I just have a test framework created: TestMacFramework.framework and I'm trying to import it into a brand new OS X Application project. I have built the .framework file and imported it into the new project, The framework appears to link okay, and I can reference the public header file I added to the framework build phases section. However, I am still getting the runtime error. I'm obviously doing something wrong here, but the Apple developer library resource for this references Xcode 2, so isn't very helpful! 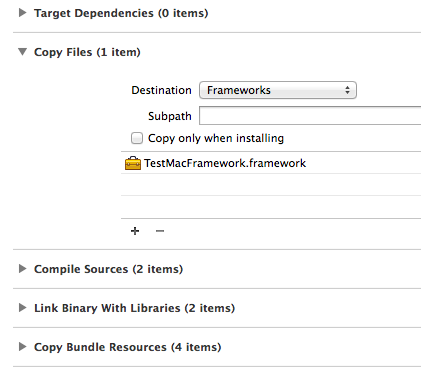 The only thing to do is to add the framework to the Embedded binaries section in the General tab of your app target. So I managed to get it working, it's quite simple when you have the right instructions. What I was looking for was a 'private' framework which lives in the App bundle rather than being written to the system library folder. None of these issues solved this for me. The problem in the end was pretty easy. 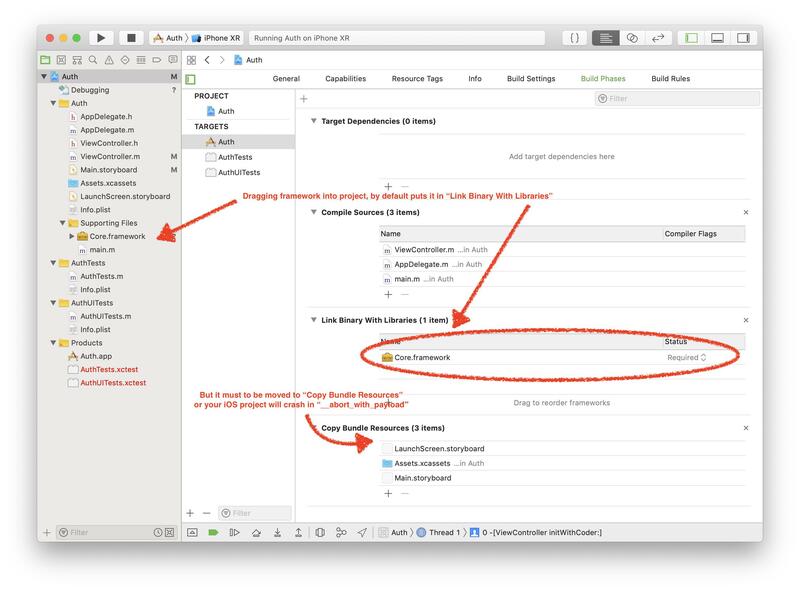 It looks like its a pretty major Xcode bug which I have logged the problem and fix under Apple bug: 29820370. If you are struggling (as it seems like there are several pages of problems similar to this ) then it would be great if you can raise a bug on bug reporter: https://bugreport.apple.com/ and reference the bug I raised to gain visibility. I want to make Xcode back into the pleasure that it was before - and this is something I am sure Xcode should have fixed itself. Here is the fix: 1. Open Keychain - go to Apple Worldwide Developer Cert. 2. Double Click on it 3. Change the permission level from "always trust" to use System Defaults 4. Save and close it 5. Restart Xcode, Clean and build your project and it should be gone. Screenshot below of the correct settings: Hope this helps! I ran into the same issue but the accepted solution did not work for me. Instead the solution was to modify the framework's install name. When a framework is embedded into an app this path should be relative and of this form: @rpath/MyFramework.framework/MyFramework. If your framework's install name is an absolute path it may not be loaded at runtime and an error similar to the one above will be produced. If you accidentally reset your keychain, this can occur due to missing Apple certificates in the keychain. I followed this to solve my problem. In reality, to have Xcode both link the custom framework and ensure that it is copied along with your code to the iOS device (real or simulator) the custom framework needs to be moved to "Copy Bundle Resources". This ultimately packages the framework along with your code executable to be available on the device together. The custom framework thus gets copied along with your code to your target device and is available at runtime. For Xcode 8, some stale products will be removed from derived data folder refer to this solution. 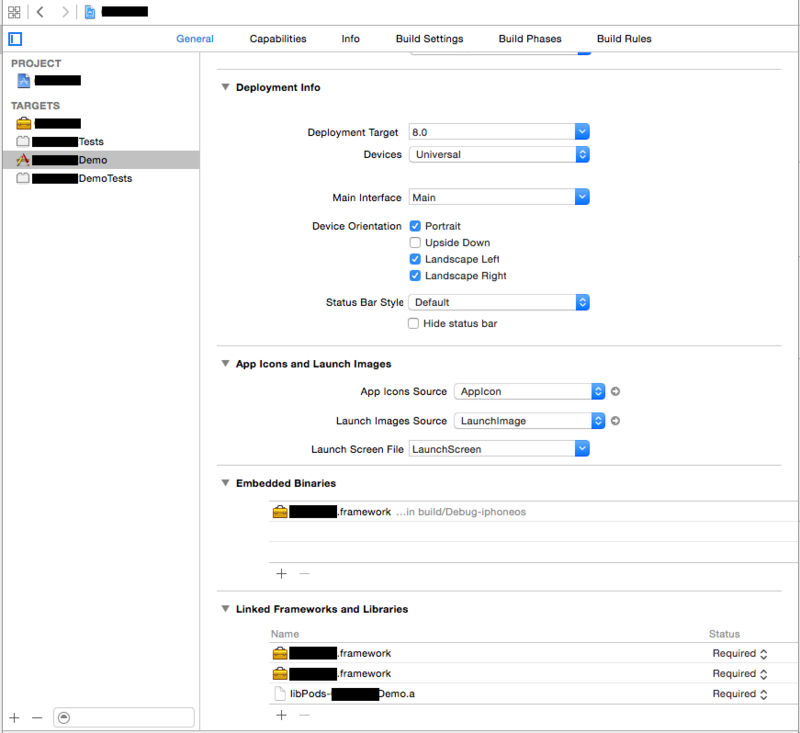 The Xcode build system supports stale file removal of some types of build artifacts that were produced in a previous build, but have since been removed from the project. Base on the author's thought, I found this build log from my case. After creating a new copy file phase and copy the target stale framework to Frameworks destination, the above removal log disappears after rebuilding. Just clarify my situation and reason, hope it's helpful for someone. For me this was the solution, after many hours of searching!! For some reason, well into the development of a Swift 2.3 custom Framework, Xcode 8 had removed the DYLIB_INSTALL_NAME_BASE setting from the project.pbxproj file. A little walk into the Build Settings / Dynamic Library Install Name Base setting back to @rpath fixed it. Got the issue when trying Xcode 9 beta and going back to Xcode 8. A simple Clean on the target resolved the issue. I had the same issue for a different reason. I've created a new configuration to Debug and Release (under PROJECT -> Info tab -> Configuration). And I had to change my pod frameworks shell script (Pods-"appName"-frameworks.sh , under Targets Support Files) to make it work. Target > Build Phases > [CP] Embed Pods Frameworks Uncheck "Show environment variables in build log" and "Run script only when installing"
I tried many fixes, but what worked for me was to delete a missing target listed in the build tab of the build scheme. You can get to it by opening the edit window of the current scheme. Edit: My UI testing target was not working as well, and the solution I found was to delete it and generate it again. Not the answer you're looking for? Browse other questions tagged macos frameworks xcode5 dyld or ask your own question. How can I delete derived data in Xcode 8? How to link a stand-alone Swift OS X app to a private framework (also created in Swift)?